Great for multi-pet households. One keychain locates up to three pets. Three color coded buttons signals each of your pets. The red panic button locates all your pets at once! Find your pet individually or or all pets at once with the simple touch of a button! The bright LED light and beeping sound works within seconds! Print your lost and found information on the included labels. 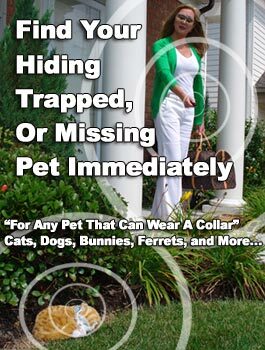 Place on the back of your pets tracking receiver for added pet safety & rescue. Train your cat safely and inexpensively with The Cat Caller. Electronic cat training collar and cat locator. Buy today!